When the weather warms up in the spring, many homeowners suffer from an invasion of ants. And what starts as a few of the little critters suddenly explodes into a full-scale infestation. The ant colony is usually outside your home, and it’s the worker ants that you’ll see tramping into your place in search of food. Some species of ants can carry disease-causing bacteria, including salmonella, staphylococcus, and streptococcus, which you definitely don’t want tracked all over your kitchen counters and food. In this Buyer’s Guide, we’ve reviewed five of the very best indoor ant killer products that you can buy today. We’ve also included some useful information on how to prevent ants from invading your home. All the products we’ve included in our Guide are proven to be highly effective against the species of ants that most commonly venture into homes while foraging. Click the links to read more information about each product, check out other users’ reviews, and to order your preferred indoor ant killer solution. Terro liquid bait traps contain a powerful attractant and an effective poison (borax). You place the traps in areas where ant activity has been seen. The ants carry the bait back to the nest, killing the queen and proving terminal for the whole colony. The bait is contained inside a plastic casing, so it won’t dry out and lose its efficacy. The traps are very easy to deploy and are mess-free. You can use the traps safely around kids and pets. Not all ant species like sugar-based baits, so the Terro trap may not be as effective against these species. Raid spray can be used indoors to kill ants that you see crawling across your floors or surfaces. The spray kills ants on contact. You can also use the spray to create a protective barrier by spraying a line across ant trails. The spray can be used indoors and doesn’t have an unpleasant odor. The product is also effective against other house pests, including roaches. The spray contains powerful toxic chemicals that could be harmful to pets if ingested. The spray kills on contact, so it doesn’t affect the whole colony. Maxforce ant killer is a ready-to-use gel bait. You can use the bait station indoors or outdoors, and it can easily be placed into crevices and cracks that ants can use to enter your home. The bait station is easy to use and doesn’t make a mess. The poison used in the bait has a residual effect that lasts up to two weeks. The gel dries out after a few weeks, meaning you’ll need to regularly replace it until the ant colony has been wiped out. 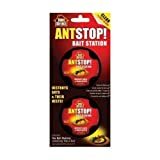 Ant Stop contains a highly potent insecticide that kills ants very quickly. The solid bait is contained inside a plastic container, so there’s no mess. The poison is effective for up to three months. The bait is quick-acting and kills ants and their nests too. The traps are ready-loaded with solid bait, so they don’t make a mess or dry out. The bait is effective for up to three months. Not all species of ants that come into the home are attracted to the bait, meaning that it’s not very effective against some species. Advion indoor ant killer is a gel-based bait that uses a sweet attractant. The ants eat the bait, ingest the potent poison it contains, and then take the slow-acting toxin back to their colony. The product is long-lasting and works against a wide variety of ant species. The product has a two-year shelf-life, so you can keep any leftover gel to deal with the following spring’s ant invasion. The gel is easy to apply into the nooks and crannies ants use to get into your home. Gel baits tend to dry out, becoming less attractive to ants and therefore losing their effectiveness. Applying gel baits can be messy. What kind of ants invade your home? All ant species usually make their nests outside in your yard. Troops of worker ants make their way inside your home during foraging trips, attracted by the smell of foodstuffs. Although there are thousands of ant species, they can be broadly divided into two primary types that you’ll find inside your home. Sugar ants include species such as odorous ants and pharaoh ants. These species are drawn to sugary, sweet things and commonly invade the home. Grease ants are not usually attracted to sugar. These species prefer fatty substances and proteins. Argentine ants, and thief ants fall into this category. Fire ants are also classed as grease ants, but they tend to be more of an outside pest. What types of indoor ant killer products are there? When it comes to getting rid of indoor ants, you have several options. Ant traps are a highly effective method of dealing with ants both inside and outside the home. 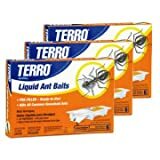 The traps are usually made from pre-filled plastic containers that contain toxic bait, laced with an attractant to tempt the ants into eating it. Some traps are transparent so you can monitor whether the bait is being eaten or not. Ant bait is typically made using a slow-acting formula that allows the worker ants to take it back to the colony where it’s used to feed the queen and her larvae. Once ingested, the poison gets to work, killing the queen and eventually wiping out the whole nest. The main drawback to using bait traps is that, at first, they will attract vast numbers of ants. That can lead to a full-scale home invasion and possibly a separate infestation in other areas of your home. Ant killer sprays come as aerosols that kill the insects on contact. These sprays can also be used to create an effective barrier across ant trails that lead from the colony to entry points into your home. Some ant killer sprays contain a repellent that works for several days. Ant sprays can be useful in getting rid of a few scouts that make their way into your home. However, sprays won’t kill the ant colony and won’t be effective against large infestations of persistent ants. Also, the chemicals contained in ant killer sprays can be dangerous to your pets and can be harmful to you if you inhale them. You should not use sprays on countertops where food is prepared. Ant killer gels are supplied in a tube with a syringe that you can use to apply the gel to nooks and crannies where ants are gaining entry to your home. Like other forms of ant bait, gels contain a slow-acting insecticide that’s taken back to the colony by the worker ants. Most gels remain effective for up to one month after initial application. Sometimes gels dry out, rendering them not as effective as when first applied. Granules are tiny pellets that contain an attractant and a slow-acting poison. Although granules are usually the preferred outdoor ant killer, you can use them inside ant traps inside your home. The main drawback of using granules in a home setting is that they can become scattered around your house, presenting a hazard to small children and pets. Also, ants may bypass the granules, preferring to focus on your food instead of eating the bait. Spraying individual ants that you find crawling around your kitchen is not an effective method of controlling them. Typically, there will be many thousands of ants living in their nest, including at least one egg-laying queen. To get rid of the problem, you’ll need to wipe out the queen and the other colony members too. Most species of ants nest outside, but your home can offer many favorable nesting locations for some species. Preferred nesting sites include cabinets, spaces behind walls, gaps behind window and door frames, and under tiles and floors. The best method of controlling and dispatching ants inside your home is to use a combination of traps, sprays, and gels. This multi-pronged approach will quickly wipe out the whole colony, ridding your home of the problem. Ants come into your home to find food. One of the best preventative measures you can take is to keep your kitchen scrupulously clean. Don’t leave food out on countertops and be quick to clean up any spills, especially of sweet things such as jam, honey, juice, or soda. Don’t allow crumbs and scraps of food to accumulate on floors either. Keep food wrapped in plastic bags or put it into sealed plastic or glass containers. If scouts visit your kitchen to find that there’s nothing on the menu, they’ll leave empty handed and won’t bother to return with their friends to stage a raid! To deter future ant invasions, you’ll need to block up and seal any potential entrance points in your exterior walls. Look around your home and seal any places that ants were using as an entry point. Scout ants are sent out from the colony to find food. When a scout discovers a good food source, it will head back to the main colony to spread the good news, leaving a scent trail leading right back to the buffet in your kitchen. If you find few individual ants in your home, it’s likely they’re scouts. Kill them immediately to prevent them from spreading the good news to the rest of the colony. In this section, we’ve provided answers to some of the questions asked by homeowners who are troubled by ants. If you can’t see the information you need, just shoot us an email and we’ll try our best to answer your query. Q: Why are ants coming into my home? A: Ants generally come into your home in search of food. Your home is also a safe place for ants to forage because it’s free-from predators. Scouts are sent out from the ant colony. Once they’ve located a good supply of nutrition, the scouts release pheromones that act as messages to their compatriots, leading them to the promised land of your larder! Q: Can ants live in the walls of my house? A: Carpenter ants can live in wall cavities. The ants chew lumber into sawdust that they use to build nests. That activity can degrade insulation and wood over time, potentially threatening the structural integrity of your home. Q: What can I use to keep ants away naturally? A: You can use pepper, garlic, and cloves as a deterrent to ants. Also, bay leaves placed in your kitchen cabinets will send ants packing. Q: What kills ants instantly? A: Ant killer sprays kill ants immediately on contact. Also, a solution of water, sugar, and borax will do the job. Diatomaceous earth is also an effective natural ant killer. Q: Can ant bait poison my dog? A: If the ant bait contains boric acid, it won’t poison your dog. Boric acid is typically non-toxic to mammals. Your pet may become thirsty and salivate excessively shortly after ingesting the bait (due to the drying action), but as long as fresh water is available these signs will generally pass quickly. However, to be on the safe side, we recommend that you contact your vet for professional advice. Ants in your home can be a nuisance and a health hazard. We recommend using the Maxforce LN Ant Bait Station to tackle an ant problem inside your home. The bait station is easy to use, has a residual effect that lasts up to two weeks, and will wipe out the entire colony, including the queen, within a few days of deploying the traps.